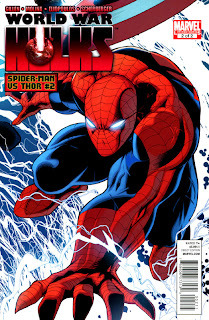 I thought World War Hulks: Spider-Man Vs. Thor #1 was less than stellar, but that was before I read the follow-up. The comic of the day doesn't have the one thing it's first issue did have: the first look at Hulk-Thor. The only thing this 2 issue mini has going for it is Jorge Molina's Thor imagery. Unlike Smurfs and the Na'vi, Hulk-Thor is blue and badass. Though, if he wasn't so easily enraged, someone should tell him that his tribal tattoos are stupid. I would say how unoriginal his lame tats are, but seeing as Thor has been around for thousands of years, in one form or another, he may be the first to sport the mark of the gym-rat. World War Hulks: Spider-Man Vs. Thor #2 is only filled with lop-sided fighting between Spider-Man and Thor. Eventually Thor stops beating up Spider-Man when he discovers that hitting spiders makes "Thor hammer heavy." Later, Thor and Spidey make up then go "smash!" I'm glad I am through with the World War Hulks comic books.